MONTEREY, Calif. – Thirty-two homeland security professionals earned a Master of Arts in Security Studies March 30 from the Naval Postgraduate School Center for Homeland Defense and Security (CHDS). The students received degrees from CHDS as part of ceremonies at the Naval Postgraduate School. 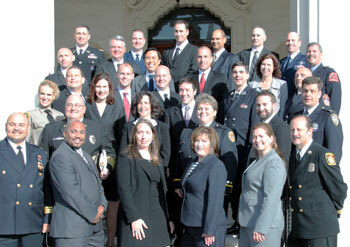 They represent a cross-section of the homeland security profession and include professionals from law enforcement, fire safety, homeland security, emergency management, social services and the military. "These graduates bring great credit to themselves and their professions. They will join the expanding network of homeland security leaders who are shaping the future of our nation," said CHDS Director Glen Woodbury. Chas Eby earned the Outstanding Thesis Award, given to the student whose thesis best exemplifies the contribution of scholarship to the study and practice of homeland security. Eby’s thesis was titled "The Nation that Cried Lone Wolf: A Data-driven Analysis of Individual Terrorists in the United States since 9/11." Eby is Chief Planner for Emergency Preparedness for the Maryland Department of Mental Health and Hygiene. Sunil Dutta was honored with the Curtis H. "Butch" Straub Award, which is presented to the student who has written an outstanding thesis and has demonstrated leadership in the classroom. Dutta is a lieutenant with the Los Angeles Police Department. The award is named after one of the founders of CHDS. Sharon Watson was presented the Philip G. Zimbardo Award, which is presented to the student’s whose outstanding analyses and keen insights exemplify the best in academic scholarship as applied to the solutions of emergent national challenges. The award is named after renowned Stanford University psychologist Philip Zimbardo, who also teaches at CHDS. Watson is public affairs director with the Kansas Adjutant General’s Office. During the 18-month online and in-residence program, homeland security officials from across the nation collaborate on current policy, strategy, and organizational design challenges. Graduates must complete a thesis relative to their employing agency and often this research finds its way into practice and policy.